Despite the convenience and overall cool factor of the various e-readers available, I don't think I'll ever buy one. 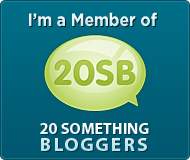 I just can't give up the experience of an old-fashioned book. I love spending an hour at the bookstore going from shelf to shelf to find just the right one. 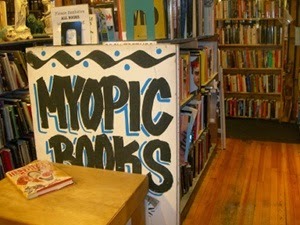 Borders and Barnes & Noble are great, but my favorite bookstore is Myopic Books. I absolutely love used books. Aside from the fact that they look better when they're loved, they're significantly cheaper. ($30 for a hardcover?! No thanks.) Myopic's books are very reasonably priced, and the selection is just as big, if not bigger, than any new bookstore. You can roam the three floors and find thousands of books you might never have thought to pick up. And everything is set in a groovy environment, ideal for maximum browsing. Myopic also buys books on Friday nights and all day Saturday. Since throwing away books is sacrilege, this is the perfect way to unload your books. I've done it a few times, and while you're not going to make big bucks, it's nice to have some spending money to buy new books. Funny story: I accidentally got rather plastered at a bar down the street from Myopic, and, not realizing how ridiculous I was, I decided this was a great time to go buy a book. I couldn't remember the name of the book I wanted or the author, so I proceeded to try to slur out the book topic to the poor cashier. ﻿I don't remember much of what happened afterwards, but the next day I found a bag in my apartment with about 10 books. Some people dance when they're drunk. Others have one night stands. I buy books.